There’s lots to like about the Quebec snowmobile destination for your next Quebec snowmobile tour or snowmobile vacation. It combines the snowy regions of Quebec City, Charlevoix and Saguenay-Lac-St-Jean. Arguably the birthplace of snowmobiling, La Belle Province consistently delivers a fully integrated snow trails system. It offers first class FCMQ trail quality, 5-star hospitality and plenty of good snow conditions. But with groomed trails in many different tourism regions, where do you start? One way is to learn about more great Quebec snowmobile tour destinations, so check out the rest of my Quebec tours. Why Quebec City, Charlevoix & Saguenay-Lac-St-Jean? If you’re an experienced touring snowmobiler looking for new adventures, a good first choice is the self-proclaimed “Snowmobile Destination”. That’s the umbrella under which the tourism regions of Québec City & Area, Charlevoix and Saguenay-Lac-Saint-Jean go to market. But is that ambitious moniker hype or reality? Is its trail system cohesive and connected? And most important, are its snow conditions good and long lasting? My snowmobile magazine mission was to assess this “Snowmobile Destination” promise. That included the quality of the connector trails between its three participating regions. Our crew for this tour consisted of D’Arcy Ball, Dan Carty, Glenn King, Don Webb, my wife, Marsha, and myself. We drove our Triton Trailers to stage from the Hotel Roquement in Saint-Raymond, just northwest of Québec City. From there, we would zigzag back and forth on our snow machines among the three regions exploring its connector trails. You may not want to duplicate exactly our Quebec snowmobile tour for your own ride. But I hope the info and snowmobile video provided here will help you decide which FCMQ .trails to ride and where to stay. Picture the “Snowmobile Destination” as a right-angle triangle. Its base is the St. Lawrence River running from Portneuf (just west of the City of Québec), east all the way through Charlevoix country to the Saguenay River. The east side of the triangle is a line north from the confluence of the St. Lawrence and Saguenay Rivers. The triangle’s tip is Saguenay-Lac-Saint-Jean. The west side runs north from Saint-Raymond to Lac-Saint-Jean. Within this triangle is a vast wilderness anchored by the eastern sections of the Laurentian Mountains. Their elevation and “Snowmobile Destination’s northerly location relative to many of its neighbours and competitors mean you can typically count on good snow conditions throughout a long winter. In fact, the Monts Valin area of Saguenay-Lac-Saint-Jean is normally the earliest opening (often in November) and latest closing (April) sector in Québec. 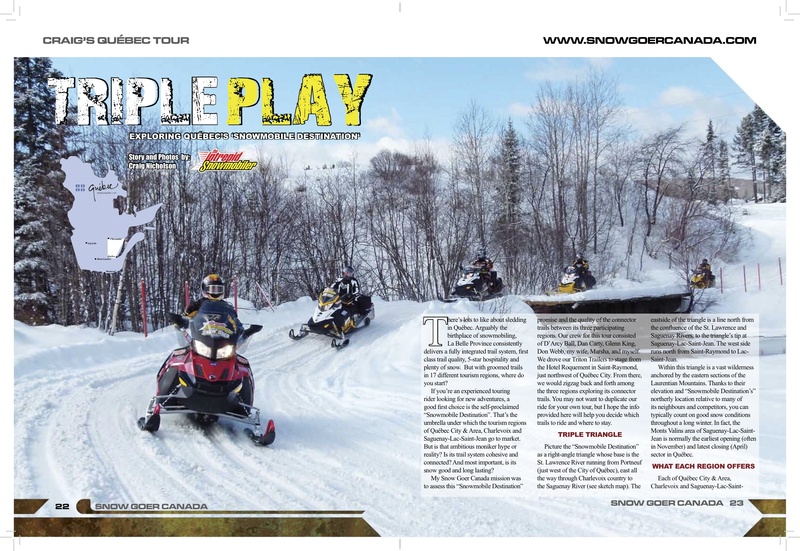 For more on this snowmobile tour, read my Triple Play article as published in Snow Goer Canada Magazine. Check out more Ski-Doo tours! Riders should reconfirm the routes and services mentioned in this article as they may have changed since publication.